When gas prices remain relatively low and incomes rise, holiday travelers can expect some company on the roads. In fact, back in July, the American Automobile Association (AAA) said a record-breaking 44.2 million Americans took to the roads to do some traveling during the Country’s national and patriotic holiday. July 4 is traditionally the third busiest travel holiday of the years, behind only Christmas/New Year’s and Thanksgiving holidays. What Can You Expect Traffic to be Like During the Holidays? Although travels costs have increased slightly, due to marginal increases at the gas pumps, it’s not enough to detour those who want to travel home for the holidays, or away from home either. Every year, AAA puts out its predictions on how many motorists it believes will be traveling on our country’s roadways, traveling 50 miles or more. Expect to pay a little more at the pump this year, with gas prices up nearly 35 cents over the same time last November. The worst day to travel on a major holiday, like Thanksgiving or Christmas is one or two days before those holidays. AAA predicted there would be 330,000 motorists stranded or broken down with flat tires over the Thanksgiving holiday. Travelers can use the AAA Mobile app to map out routes, find the cheapest gas prices, request AAA roadside assistance, and locate AAA approved auto repair shops. Don’t forget to buckle up before heading down the highway. Clear any windows or doors of snow for maximum visibility and to avoid blind spots. Be responsible and don’t drive impaired. Besides, who wants to spend the holidays in jail? Drive the speed limit. Speeding nearly triples the chances of crashing. Pass trucks on the left and do your very best to stay out of blind spots. Avoid distracted driving, which is a major cause of car collisions and one of the leading causes of teen fatalities. Avoid cutting in front of large trucks, as they are much heavier and take longer to stop than other motor vehicles. Give your vehicle a thorough pre-travel check-up, including inspections of your wiper blades and fluid, make sure your radiator is topped off and in good working order, and that you have enough engine oil in the engine to make a safe trip. Make sure you have plenty of rest and fluids to stay hydrated on your journey. Leaving early usually helps people avoid taking risks later on during their road trips. Stay abreast of weather conditions, as they can change from location to location. 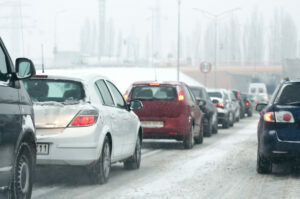 Were you or a family member in a holiday travel car accident? If so, contact our experienced Fort Wayne Car Accident Attorney at Finderson Law, LLC to get professional and legal answers about questions you might have surrounding claims, settlements, financial recovery, and more. The first step to financial recovery is to call and schedule a free, no-obligation consultation at (260) 420-8600 or email us using the contact form on this page. 1“Nearly 51 Million Americans to Travel This Thanksgiving, Highest Volume in a Dozen Years” published in AAA Newsroom, 2017.